I went yesterday to visit a family relative of my wife’s in Bayit Ve’gan who is recovering from a light heart attack and thought, maybe I should take things down a notch with the food. 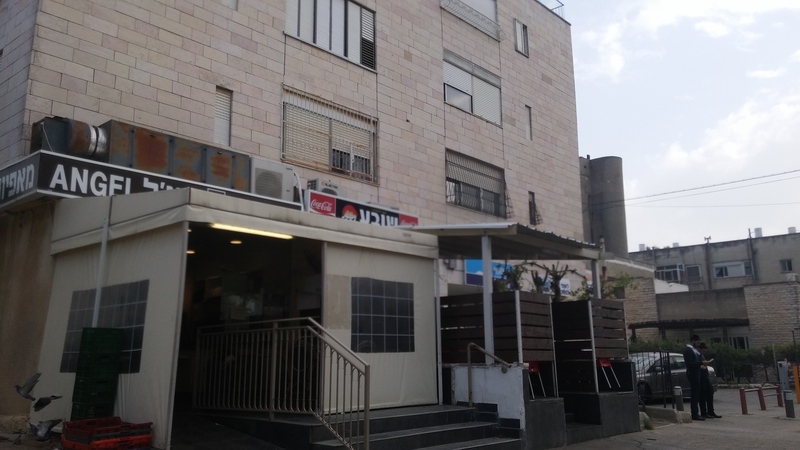 So across the street from the apartment, there’s a bakery, a bank and a rec ently re-opened shwarmah joint called Sovah(kosher mehadrin, badatz, shmita lechumra). So obviously, heart attack=shwarmah so I went there to get a shwarmah for my wife and myself. 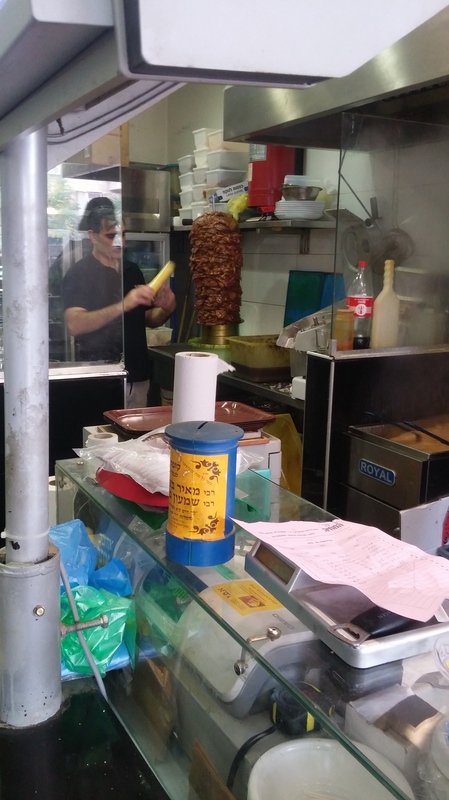 While ordering I saw them prepare their own shwarmah pit. I have to say, it was very impressive. 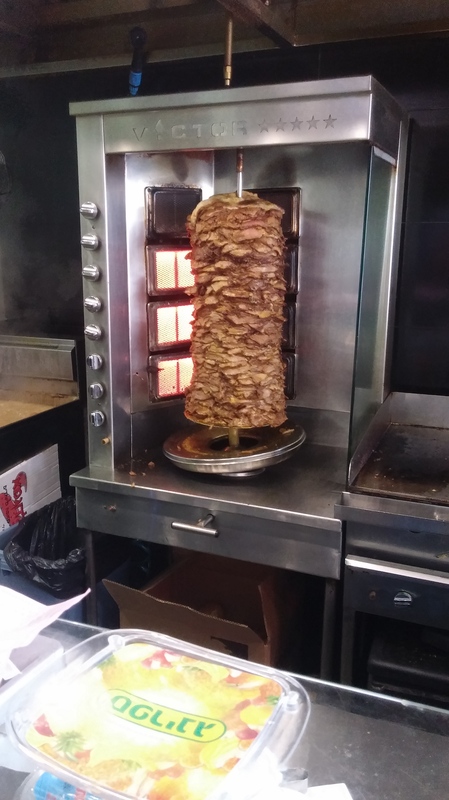 Most shwarmah joints just order the meat ready to go on a spit and everything, so seeing them do this in-house was very impressive. Not only was it marinated in-house and stacked up nicely, they only use beef. almost everything there was prepared in-house, and for a greasy spoon in Bayit Ve’gan, that’s pretty impressive. When I buy a shwarma, I judge it in a couple of ways: First off is flavor of the meat. Is it dry, flavorful, spiced well. Then by the laffa bread: How thick is it, is it fresh. Then I check out the condiments, are they fresh, prepared in-house. Then the fries; are they store-bought or made in-house. And finally the girth of the whole thing. I mean is how they pack it up, the meat to condiment ratio that the meat has to be even or more than the sides going into the laffa, And lastly, if I can hold it in one hand or in two. Not many places hold up to my standards, but if you do find a place like that, go back for another because you won’t find many like that around. So I ordere d myself a classic shwarma; chummus, salad, pickles, coleslaw, tehini a hint of heat and hand cut fries from real potatoes and of course the meaty goodness, and boy did they stand up to my expectations. The meat was seasoned perfectly, it was moist and full of flavor. the salads and condiments were really good and fresh and the laffa was very light. The only downfall of this was like in most shwarmah joints that cut their own fries is that they only fry them once. It’s disappointing because then the fries are limp, soft and soggy. All they have to do is fry them again and it makes such a difference. Otherwise it is a great shwarma and one of Jerusalem’s best in my opinion, and there a are a lot so that’s saying something. The guy’s behind the counter were nice and it was a really great lunch experience. Previous PostA Dinner for two at Tommy’sNext PostOlla from Eilat!